Arthritis is a disease found in both cats and dogs and is especially common in dogs. It can affect pets of all ages. Arthritis is defined as the inflammation of one or more synovial Relating to or denoting a type of joint that is surrounded by a thick flexible membrane forming a sac into which is secreted a viscous fluid that lubricates the joint.joints, usually accompanied by pain, swelling and stiffness. An example of synovial joints in dogs and cats includes the joint that connects the skull to the lower jaw. There are multiple types and causes of arthritis. Some causes of arthritis are joint instability, ligament injury, trauma, degenerative changes, infection (bacterial or fungal arthritis), metabolicRelating to the sum of the physical and chemical processes in an organism by which its material substance is produced, maintained, and destroyed, and by which energy is made available. disturbances or immune mediated disease (rheumatoid arthritisA chronic progressive disease causing inflammation in the joints and resulting in painful deformity and immobility, esp. in the fingers, wrists, feet, and ankles.). 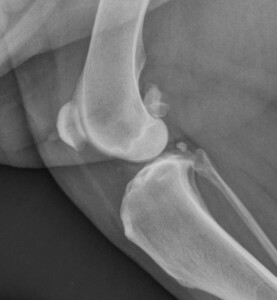 OsteoarthritisDegeneration of joint cartilage and the underlying bone, most common from middle age onward. It causes pain and stiffness, esp. in the hip, knee, and thumb joints., which is caused by joint or ligament injury, is the most common type of arthritis in dogs and cats. Joints are made up of a thin layer of slippery, pliable cartilageFirm, whitish, flexible connective tissue found in various forms in the larynx and respiratory tract, in structures such as the external ear, and in the articulating surfaces of joints. It is more widespread in the infant skeleton, being replaced by bone during growth. that covers the ends of bones. The joint is surrounded by a capsule, and the space within is full of a clear, slippery joint fluid. Arthritis occurs when the cartilage layer covering the bones is eroded and the ends of the bones rub together, causing inflammation. The body responds to constant inflammation by developing osteophytesA bony outgrowth associated with the degeneration of cartilage at joints., or bone spurs, around the margin of the joint. The joint fluid becomes thin and less slippery, and bone-on-bone contact causes pain with movement. Figure 1. Radiograph of a normal canine stifle (knee joint) with no arthritis. Figure 2. 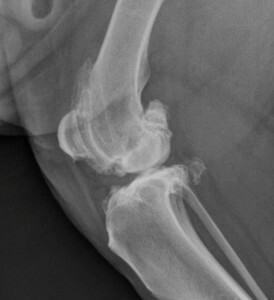 Radiograph of a canine stifle (knee joint) with advanced arthritis. Same dog as in figure 1, opposite stifle. The primary symptom of arthritis is pain. Dogs will limp, become less active or be sometimes slow to rise or slow to lie down. Some may be restless when sleeping or be reluctant to go for walks. Cats usually show few specific symptoms of arthritis. Most commonly they just become less active, which is often attributed to laziness or age by their owners. They may also be hesitant to jump on furniture or less likely to use the deep litter boxes that have higher sides. How does a veterinarian diagnose and treat arthritis? Diagnosis begins with a thorough orthopedic exam. The most commonly used diagnostic tool for arthritis is radiography (i.e., x-rays). Other tests may also include CTAn X-ray image made using computerized axial tomography. scans, an MRIMagnetic Resonance Imaging is a diagnostic technique that uses magnetic fields and radio waves to produce a detailed image of the body's soft tissue and bones. or a joint fluid analysis. Bone scans are sometimes recommended to help identify areas of inflammation in a patient. If there is an identified cause of arthritis, the underlying cause needs to be appropriately treated. Arthritis due to joint or ligament injury, the most common cause of arthritis in dogs, is most often treated with surgery. A delay in diagnosing sports injuries such as cruciate ligament tears, patellar luxationsIs a condition in which the patella, or kneecap, dislocates or moves out of its normal location. and hip dysplasia allows arthritis to develop. Accurate diagnosis and timely surgical intervention is key to preventing long-term arthritis. Infectious arthritis is treated with antibiotics, and immune mediated disease is treated with immunosuppressiveA drug that suppresses the immune response of an individual. medication. Osteoarthritis is not reversible, and once present, it can progressively worsen over time. Osteoarthritis without a correctable underlying cause is treated with a multimodal approach to alleviate pain and discomfort. There is no single reliable solution to the symptoms of arthritis, but several different treatments working together will often be successful. Weight loss for overweight pets is the No. 1 proven treatment to improve comfort and function of arthritic joints. Pets should have a normal to even slightly thin body condition. Decreasing the amount of food fed, eliminating or substituting pieces of raw vegetables as treats and weighing your pet monthly are suggestions that may help with weight loss. Weight-loss diets are available. Underlying medical problems such as low thyroid function may contribute to increased weight. During periods of pain and lameness, exercise should be limited to house confinement and on-leash walking as the only outside activity. This will allow inflammationA localized physical condition in which part of the body becomes reddened, swollen, hot, and often painful, esp. as a reaction to injury or infection. in the joints to subside. After the initial rest period, controlled, non-concussive, strengthening exercise should be initiated. The best exercises to strengthen the muscles around the joints and improve function are swimming and straight-line walking. Walking should begin slowly, for 10 to 15 minutes a day, gradually increasing to 30 minutes three to five times a week. The dog should be kept on a leash at all times. Swimming is the ideal exercise for patients with orthopedic disease, if possible. Again, short sessions of five to 10 minutes initially are recommended, followed by then gradually increasing swimming time to 15 to 20 minutes throughout a period of several weeks. During the period of strengthening, dogs should not be allowed to run off-leash, chase a ball, play roughly with other dogs or do other concussive, strenuous activities. After weight loss is achieved (if necessary) and the muscle mass is stronger from the controlled exercise, these activities may be allowed. Rehabilitation therapy is proven to be of significant benefit in people with osteoarthritis. Trained canine rehabilitation specialists can teach you techniques you can do with your dog at home and can recommend an exercise program that may include an underwater treadmill. Non-steroidal anti-inflammatory medications (NSAIDs) may be used in pets under the close care of a veterinarian to decrease inflammation, swelling and pain. These drugs are among the most effective for treating pain and inflammation but also have the most possible side effects. When following closely the dosages prescribed by a veterinarian, NSAIDs are generally safe with a low risk of side effects. 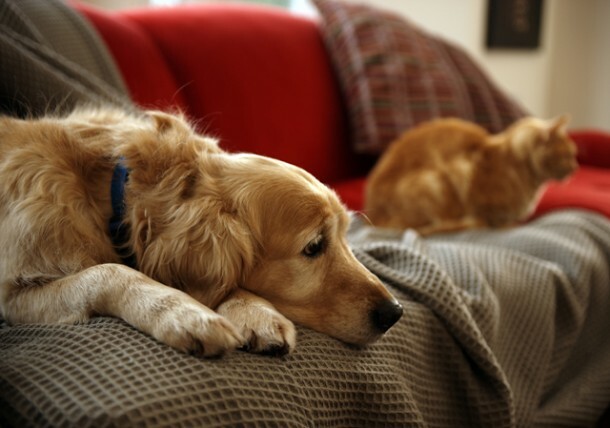 Side effects are more common in older, ill or debilitated animals but may occur in any pet. Never administer human medications to your pets without consulting your veterinarian and following his or her recommendations. Many human arthritis medications, such as aspirin, acetaminophen, ibuprofen and other prescription medications, are highly toxic to pets and can cause severe illness and death. The most common side effects of NSAIDs are mild gastrointestinal signs (e.g., decreased appetite, diarrhea) that will likely dissipate after a few days once the medication is discontinued. The more serious and potentially life-threatening side effects include adverse effects on the gastrointestinal tract, kidney and liver. Your veterinarian will likely recommend obtaining baseline bloodwork before prescribing an NSAID. These values should be rechecked every six months to look for kidney or liver value elevations. It is very important for your pet not to take NSAIDs if they are taking any kind of steroidal medications (e.g., steroid injections for allergies), as the combination can cause serious gastrointestinal ulcers and bleeding. Clinical signs include vomiting (especially with blood present) and dark, tarry stools. If any of the signs indicated above occur, stop giving the medication and contact the prescribing veterinarian. The kidneys of cats are very sensitive to NSAIDs, making medical therapy for cats with osteoarthritis challenging. For cats and other animals with NSAID-sensitivity, other medications are used or used in combination (e.g., buprenorphine, tramadol, gabapentin or pregabalin). Oral joint protective medications such as glucosamine/chondroitin sulfate supplements may be administered to help improve the health of the joints. These supplements are generally considered to be safe, with very few side effects, but may take several weeks or months to have an effect. Adequan, an injectable polysulfated aminoglycan, also has been shown to be effective treatment of degenerative or traumatic joint disease in dogs and cats. There are several excellent diets that are specially formulated for dogs with osteoarthritis. By increasing omega-3 fatty acids and other nutrients, mobility may increase in arthritic pets. There is much ongoing scientific research about cartilage grafts, stem cell therapy, laser therapy and other modalities that may prove to be helpful in the future. Dr. Joanne N. Franks is a specialist in veterinary surgery at the Dallas Veterinary Surgical Center, Grapevine, TX.